Happy Monday everyone!! Man does Monday have a different feeling now that I have all school aged kids! Mondays are pretty much my favorite, they are a quiet peaceful refuge after the hubabaloo (spelling??? LOL) of the weekend, and they are my time to sit down and start off my work week on what ever note I please. This is the view coming in through my door. 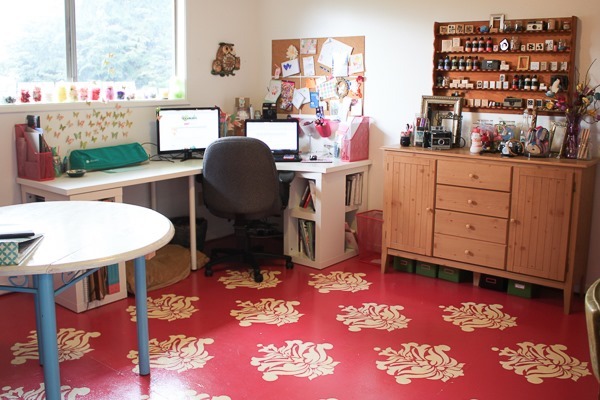 I LOVE my massive Ikea Desk, and my lovely PINK floors! 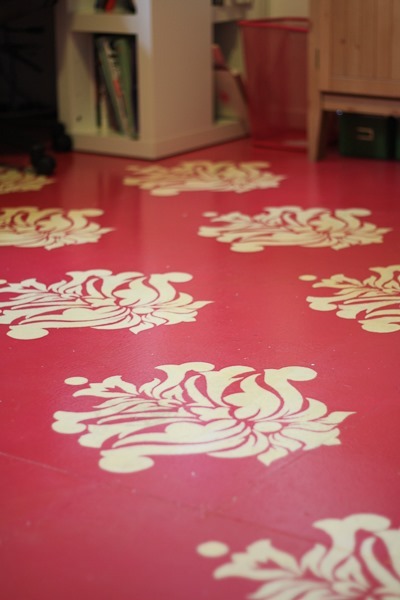 I pulled up the old gross flooring when we first moved in and painted the subflooring with a lovely hot pink – then, the stenciling you see is something I had cut and drew myself – all of that covered by several coats of a glossy polyurethane. It is so shiny and quite hardy too, over time I’ve spilled paint and glue and what not, and it is so nice to be able to just wipe it up – eventually these will probably be hardwoods, but I so love having a hot pink floor! What better way to assert my girliness in a house full of boys! 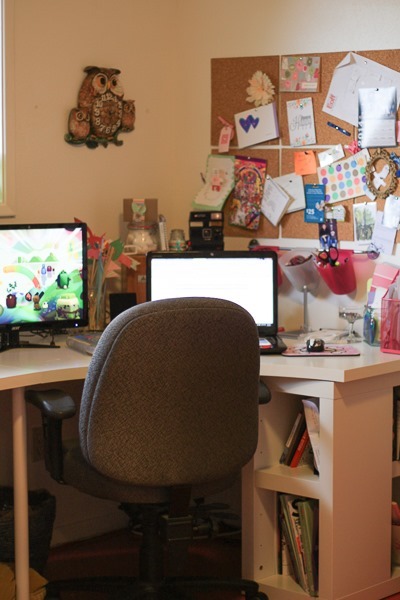 This is the part of the office where my actual working happens – my huge desk has plenty of space for my second monitor and I make good use of my cork board squares, filling them up with little bits of notes and inspiration. I orderly is not really how I think so it is fun to have some cute stuff surrounding me too while I work, and my big desk has plenty of space for whatever it is that I need near me, including of course, my Wacom and my notebook that holds all of my inspiration and to do lists. On the other side of my desk sits my lovely Silhouette Cameo – my newest toy and one of my favorite things in the universe! If you don’t know what a Silhouette is you do not know what you are missing! 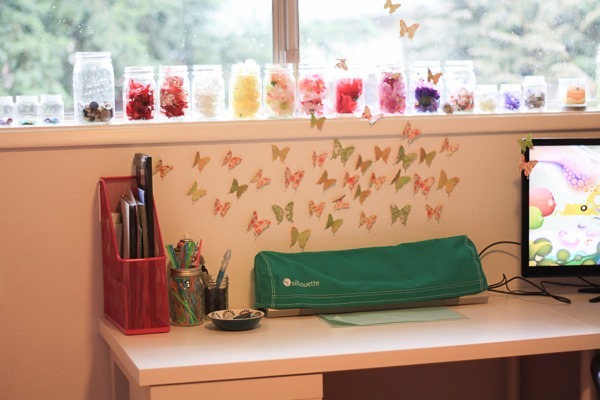 (see here) the day I got mine I went a little hog wild cutting out paper butterflies so I decided to let them swarm my wall and climb my monitor, window sill and a few are even perched on my adorable mason jars filled with flowers. Next to the flowers, I also several baby food jars that hold various colors of bright colored buttons! This bureau holds fabric on one side, papers and such on the other side, and the middle drawer holds all my jewelry supplies. I absolutely adore the little shelf above it, which actually used to be a display shelf for little collector spoons! The previous owners left it here and I knew it would be perfect for my paints and stamps as soon as I saw it! 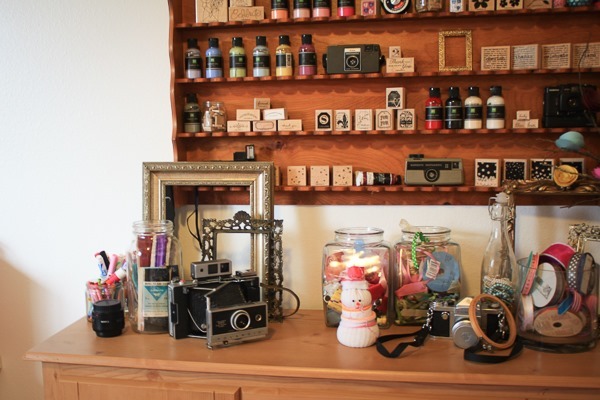 I’ve been growing a collection of vintage cameras – you can see I have some displayed here – how awesome is that telescoping polaroid camera?! I found all of my cameras at the goodwill outlet warehouse and garage sales. I’m also a big sucker for pretty frames and so I have them set out here and there…. you might notice too, I’m a wee bit obsessed with putting things in to glass jars! On the side of the room opposite my desk is my awesome working vintage sewing machine! I got it for 25 dollars on craigslist! 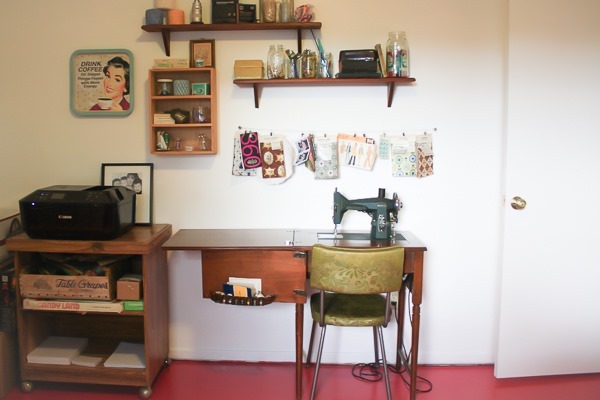 I also have a contemporary sewing machine in my closet that can sit on that table if I fold down the vintage machine. Above my machine is a little wire hanging line with some cute vintage fabric samples hanging from it. Next to the sewing stuff is my printer/scanner, I used an old microwave cart to hold it, and below it sits a bunch of vintage goodies and other stuff I might like to use for scanning. (Do you love the chair?? It is so 60ies I can’t even stand it!!! I got it for 3 dollars at goodwill – if you like digging through bins searching for treasures you totally need to see if there is a Goodwill Outlet near you! The table is another up-cycled goodwill outlet find! I posted about that DIY project on my blog HERE. The sides fold down so that I can have more space if I need, and hubby was so sweet and rigged up some makeshift supports for the sides for me too. It is on little felt feet and is pretty easy to slide anywhere I’d like in the room. 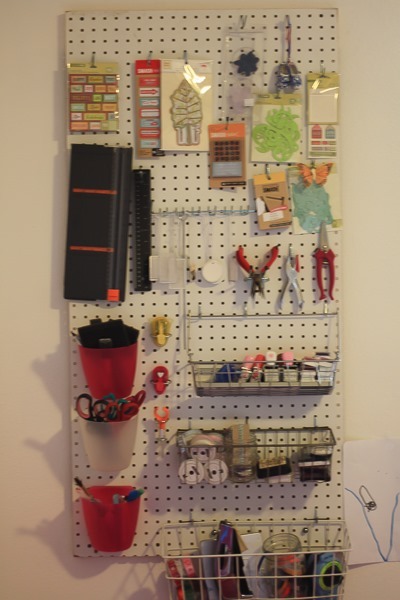 This pegboard holds all of my tool type-things, plus some ink and bakers twine – on the top there are just really random element packages I had – now that I’m starting project life I may end up switching it up, but I’m also saving my pennies to get this cart from Ikea to sit in that corner and hold all my Project Supplies specifically. 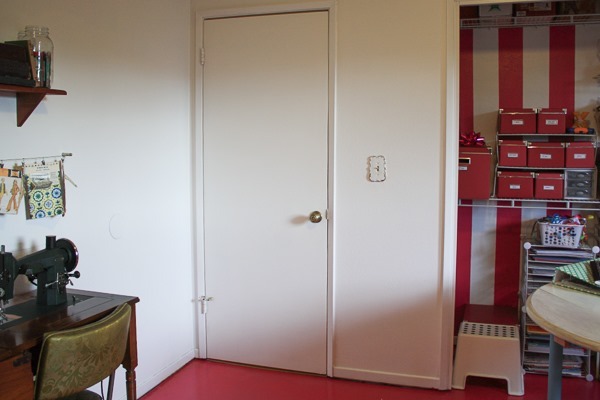 I took the doors off the closet in here and, on a whim, I painted big pink stripes inside. I LOVE them, especially now that I have those great pink boxes (also from ikea) To match. 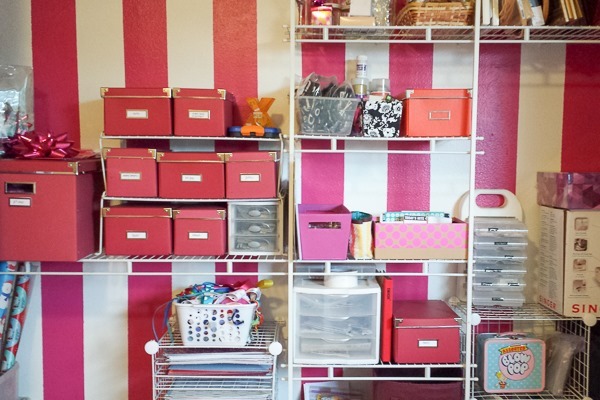 Everything is pretty sorted in there and any crafting needs are well with in reach of my table. So much hot pink Cuteness!!! 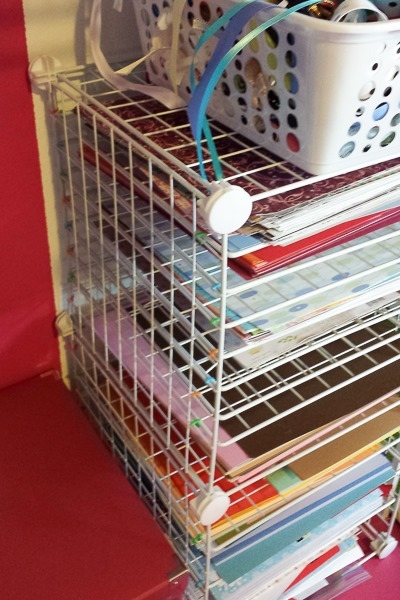 I’m especially proud of this paper rack I made that is the perfect size for scrapbook paper. We had loads of those wire cube shelf parts and so I was able to make the cube frame and then use plastic zip ties to put the wire shelves inside of it. I was so excited when I saw this idea HERE. Yep. I have a door. So just incase I need to hide out from the kids in the summer or on a weekend, I totally CAN! Serenity. There you have it! I love love love it here, the colorful floors, the bright white clean walls, all of the yummy vintage goodies. It is wonderful, and it is so ME. 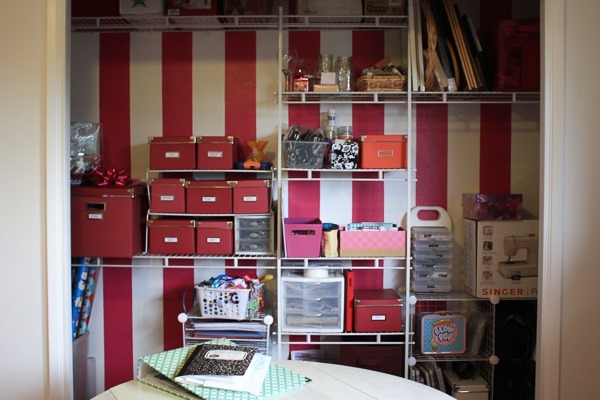 Sometimes, on a day like today in the fresh start of a new week, with my organized beautiful space all around me, creativity just flows – I am overwhelmed. I feel so so happy and so so blessed. I truly do love it here… my favorite place to be and it is just a few steps away from my bedroom! Thank you for coming to see my creative space – I call it my studio in here, because I don’t just work in here, and I don’t just craft in here. I create art in here. What a gift! One more little note! I’m really excited to share with you that my amazingly talented Creative team will be coming here on my blog to share tips/tricks/links and goodies with you along with me! I am not going anywhere and you will still hear from me regularly, but I’m bringing my team along to share with you even MORE! Tomorrow my lovely Zora will be here and I know you will love what she has to share! Have a happy rest of your Monday everyone! 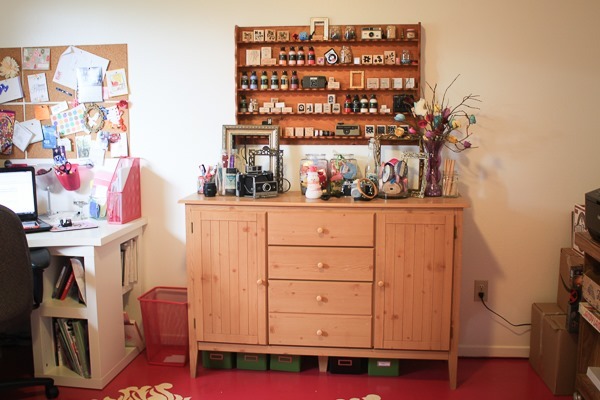 Looks like a dream craft room!